December - the month that marks the end of another year - an exciting time that's filled with new hopes and resolutions to begin a brand new year and of course, celebrations of various festivals and events fill the air. We have all been looking forward to this joyous month and it's finally here! If you wish to end your year in a fun way, but have failed to come up with a plan to do so, then fret not. India is filled with so many things to do, exclusively for every month. Be it visiting places, attending festivals or going on an adventure, here are the things you can do this boisterous month of December. Patnitop is a gorgeous hill station that has a stunning panoramic view of snow-clad mountains and infinite stretches of rich green meadows. This picturesque location in Jammu & Kashmir is known for being a fantastic spot for paragliding. The height and wind movement during December offers the perfect push for a good paragliding experience. If you're feeling adventurous, head to Patni Top and visit places like Nathatop, Naag Mandir or even try skiing while you're here. With a pleasant climate of warm days and cold winter nights, Kaziranga is a great place to go during December. This post monsoon season is mild; therefore, you can spot the famous one-horned rhinoceros in plenty. Declared as a UNESCO World Heritage Site due to the population of rhinoceroses, Kaziranga is also home to other animals like wild water buffalo, swamp deer, tigers, etc. You can also do some birdwatching since Kaziranga is home to birds like spot-billed pelicans, Blyth's kingfishers, etc. Chennai is a beautiful city, but the sweltering heat that persists almost throughout the year might make it hard to go sightseeing. But the winter months of November to February is when you can experience the best of the city's weather. Relax in Marina Beach, witness the beautiful Fort Saint George or attend the many cultural festivals that take place during December, such as the Chennai Music Festival, Red Earth Sari Festival, etc. On the account of being a former French colony, Pondicherry, which is also known as Puducherry, is a great place to celebrate Christmas at. There are quite a few beautiful churches, such as the Basilica of the Sacred Heart of Jesus, St. Andrew's Church, etc. While you're here, have the best of wine from the fancy restaurants of Pondicherry, unwind at the beautiful beaches, such as Auroville Beach, Paradise Beach and more. Konark in Odisha is known for the beautiful Sun Temple that is located 35 km from Puri. Dedicated to Sun God, it is the most popular of all the sun temples in India. Every year, this temple celebrates the Konark Dance Festival between Dec 1 to 5, when the many different forms of Indian dance are performed at the backdrop of this temple. Witness classical forms of dance, such as Odissi, Kuchipudi, Bharatanatyam and more, being performed by renowned artists from all over the world at this temple. 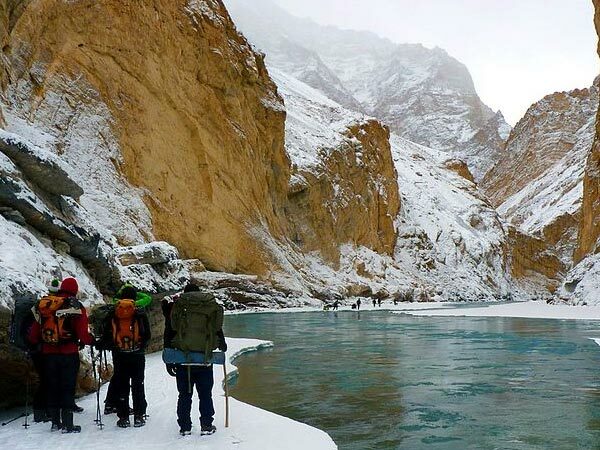 Also known as Zanskar Gorge, Chadar Trek is a winter trail where you trek on ice! For those adventure enthusiasts who want to try something new and thrilling to end the year, plan a trip to Leh-Ladakh and attempt the Chadar Trek. It begins at Leh and is a 7 to 8-day trek. Since the trail is on ice, the difficulty level is, without a doubt, difficult. You need a certain level of experience in trekking before planning this trek. Many camp services in Ladakh provide good packages for this trek. Goa, as we know it, is the party capital of India that is the best place to be for both Christmas as well as New Year's Eve. A number of music festivals, such as Sunburn, NH7 Weekender, etc., take place around this time making it the most happening place in India. Go beach-hopping to the numerous beaches of Goa like Anjuna, Arambol and Vagator, attend various music festivals and have a fantastic time in Goa this December.